We recently sold this to a friend of the shop. These are the modern wood wheels we built that I posted about not long ago. wood wheel builds We also special ordered the white Schwalbe tires for him. White tires were common on early bikes, the rubber is white naturally and then dyes are added to produce different colors. So, this was a modern, rideable solution to mimick the early wheels / tire combo. The frame is a Monarch, which were an American company out of Chicago. The bike is a fixed gear, as most were at this time, late 1890's. 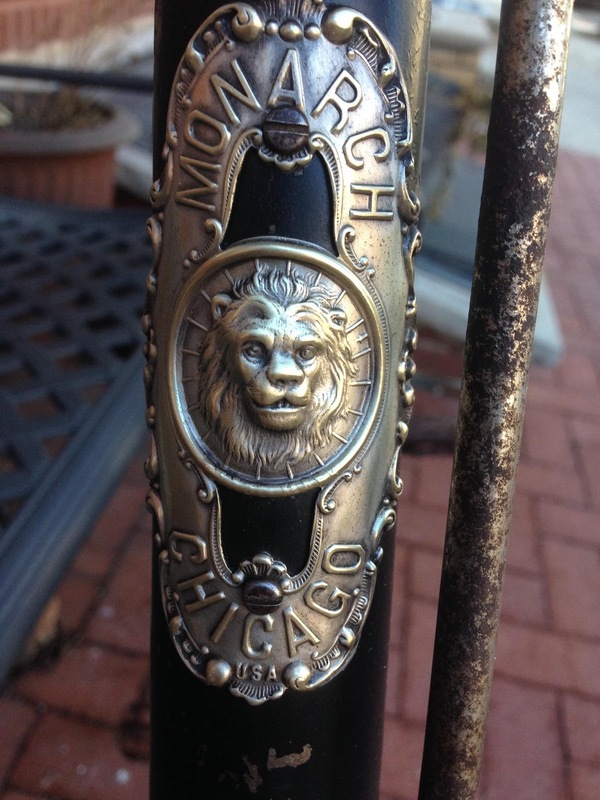 The part of this bike I really like is the headbadge. This one has been painted over unfortunately. The expression on the lion's face is great. The owner cleaned all the paint of the badge and it looks fantastic! See the before and after photos below! Enjoy. This is another one of my personal bikes finally built up! It is an early 1980's RIGI, which is an Italian marque. Here is a link to the Classic Rendezvous page about it: RIGI I bought it as a frame and fork from a fellow CR list member back in March 2015. It has been hanging in my basement ever since. It took me a while to get all the parts for it. Also, I am the proud father of two young children, so I have very little free time. I have been slowly assembling it over the past couple of weeks and now it is complete! Minus bar tape, I am still figuring out stem length. I took it for a ride yesterday and it is one squirrely bike! It is very quick handling and twitchy at speed. The very steep geometry also took a bit of getting used to. I look forward to a lot of hill climbing on it as that is where this design excels. Campagnolo high flange hubs laced to gold anodized Mavic Record Du Monde De L'Heure rims. Campagnolo Super Record brake calipers with O.M.A.S. Titanium center bolts and alloy hardware. Campagnolo alloy brake pad holders. Campagnolo Super Record cranks with Arnold Industries gold anoidized alloy crank bolts. Campagnolo Super Record single bolt seat post. Campagnolo Super Record head set. Regina Oro freewheel and Regina Oro drilled plate chain. Enjoy the photos. Thanks to Steven Willis at the bike Stand in Scotch Plains, NJ for selling me the frame and fork and Mark Petry for hooking me up with an original RIGI cycling cap to round out the project!